I have plenty of things to be thankful for this year, and one of them is this 20 pound turkey I'm about to carve. Doesn't he look delicious? Gobble Gobble! 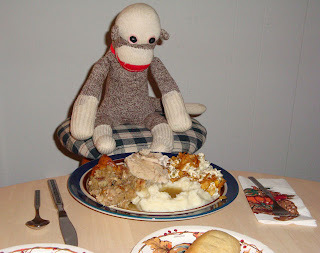 I'm surveying my plate-o-plenty before I dig in. There's turkey, stuffing, green bean casserole, yams (don't ever ask Mark about yams...), mashed potatoes, gravy, rolls and cranberry relish (not pictured). Bring it on! I might do seconds too! Now for the finale. Look at this luscious pumpkin pie with whipped cream. This is going to hit the spot! Ohhh... my pink eyes were bigger than my stomach. I ate way too much, and now I can't move. It's time to drift off into a turkey coma. I'll be signing off for tonight. 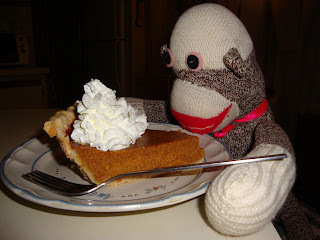 I hope everyone had as great a Thanksgiving as I did. As some of you may know, Mark had surgery today to implant an Ommaya Reservoir in his head for future chemotherapy. 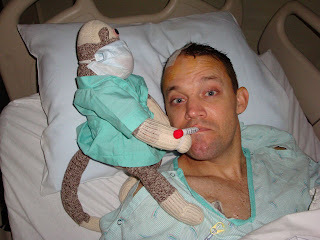 He has a fantastic blog with incredibly detailed information about his condition at Mark's Melon if you want to check it out. 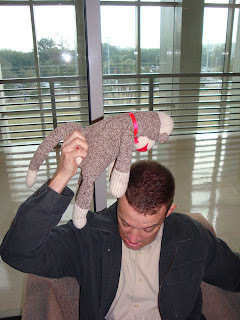 Here I am doing my pre-operative examination of the patient's head at the hospital this morning. During and after surgery, I kept track of Mark's vital signs. Here I am checking his temperature. I am wearing my surgical gown and mask to maintain a sterile environment for my patient post surgery. By the way, everything went very well! 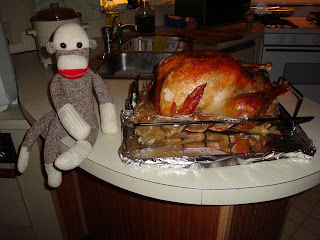 Mark will come home tomorrow, and he'll be enjoying a big Thanksgiving celebration feast on Thursday. I'm sure he'll update his blog very soon with all of the medical details. The following post may contain an image that is disturbing to others, so viewer discretion is advised. You have been warned! 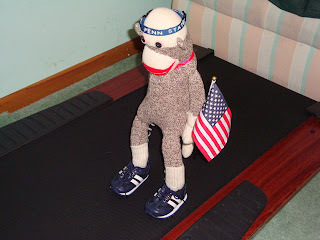 You may recall that I am an Olympic champion runner in the monkathon from my posts earlier this summer. Laura is also a runner, although far from Olympic caliber. I'd like to introduce another athlete in my family. Monka is a legend in his own right. As you can see from his fierce demeanor, he is a force to be reckoned with. 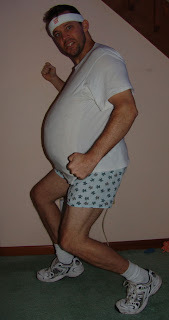 Fists a pumping, belly a bouncing, you better get out of his way when he's sprinting towards you. Monka's motto is "Float like a watermelon sting like a bee." 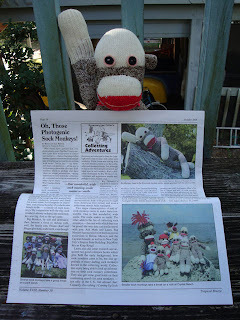 Extra Extra - Read all about ME! 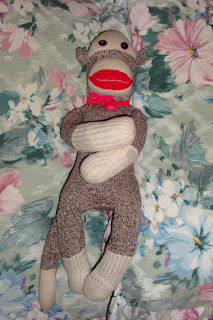 I am a bit of a Renaissance monkey. Here are some examples of fine art that I have added to my collection. The first is a self portrait crafted out of wire, created by the talented artist from Picturesque Wires. 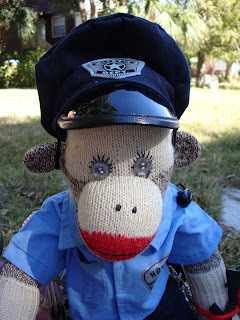 If you peruse this web site, you shall find my likeness under M for Monkey. She perfected all of my characteristic features including my pink eyes, Popeye forearms and classic red bow tie. 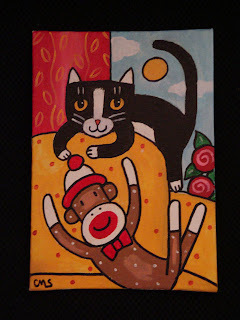 The picture below represents peace, love and harmony between tuxedo cat and sock monkey. This is an example to live by. Karl and Megan (the resident tuxedo cats) are completely on board with this concept now. 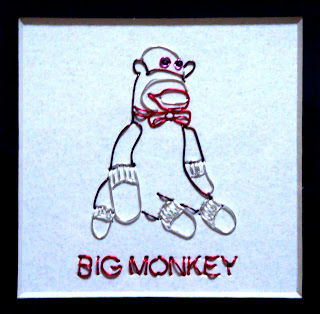 Their initial interpretation was that tuxedo cat knocks sock monkey down and plays with the red pom pom atop his hat. I have firmly corrected this notion. This fine piece of artwork was created by the eBay seller affordable!!art. 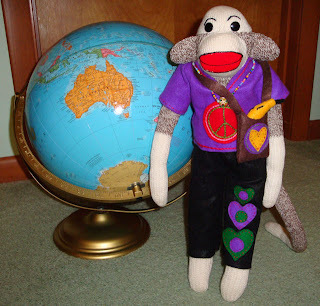 My name is Herbert, and I've come all the way from Australia to join Big Monkey's clan. He seems like a good bloke, and you've got some bloody nice beaches here in Florida. Blimey! There's a lot of pretty sheilas living in Crystal Beach! 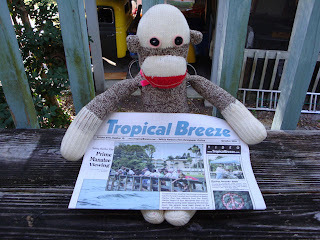 I've traveled far from home, but no worries, because Big Monkey and his friends have made me feel welcome. Throw another shrimp on the barbie because I'm here to stay! I've come to America bearing gifts for my new host. Bananas are always appreciated. 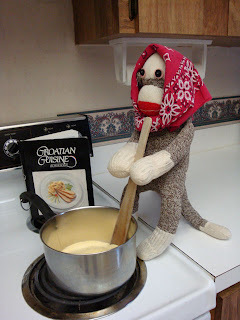 You Bet Your Babushka I'm Croation! I'm preparing one of my favorite meals from "Croation Cuisine the modern way." It's called Goose Turopolje style. The fun part is catching the goose with your bare hands! Right now I'm mixing together the side dish which consists of corn grits, goose liver, stomach and spices. Yummo! I'm donning a traditional head scarf called a babushka, just like my ancestors from the old country. If you would like the full recipe for this luscious dish, just let me know. That's ME, by the way! It's my Croation code name on Facebook. 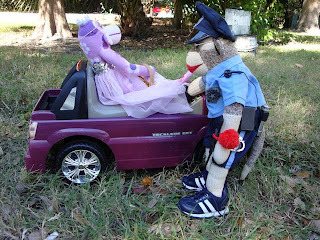 Can you believe the Facebook Police wouldn't let me join as Big Monkey? That's OK because I am one step ahead of them... ha ha! I've already got several friends, and I'm looking for more! Drop me a line, poke me, send me presents, etc. Some of my entourage might be signing up in the future. 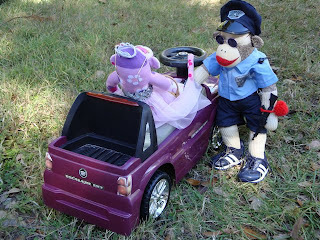 I wonder if they'll let Officer Po Po join? If not, we'll call him Službenik po po. More to come on my Croation heritage... I'm digging out my organ meat cook book to share some of my favorite recipes from the old country with you. 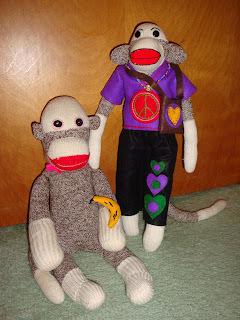 Sock monkey and swing voters came out in full force and led the Basock - Big Monkey ticket to a sweeping victory! 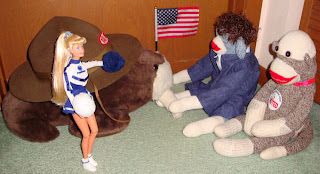 Here the two rivals, Basock and Cecil shake paw / tusk after a rough campaign. 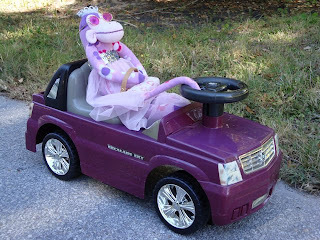 Cecil will continue to be a maverick, and Barbie will disappear into cheerleading obscurity. 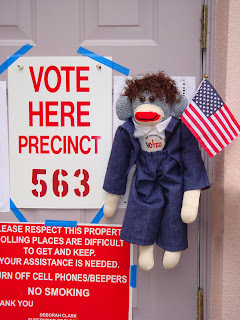 Our sock monkey candidate for President, Basock, poses in front of the Crystal Beach Town Hall, Precinct 563 in the State of Florida after casting his ballot. He is proudly displaying his American flag and "I Voted" sticker. 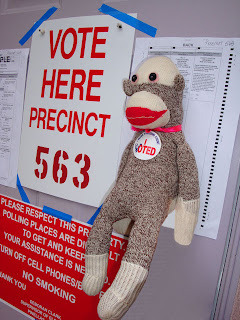 The hopeful vice presidential candidate, Big Monkey, smiles broadly after participating in the democratic process. 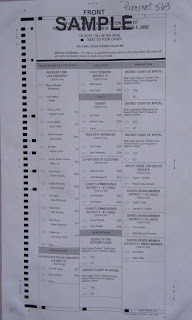 Here is a sample ballot illustrating the candidates for U.S., state and county offices. 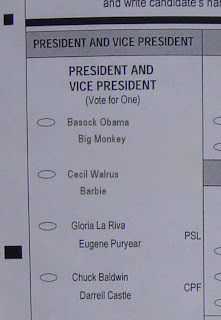 A close up reveals our two major party candidates - Basock and Big Monkey as well as Cecil Walrus and Barbie. This is going to be a tight race. 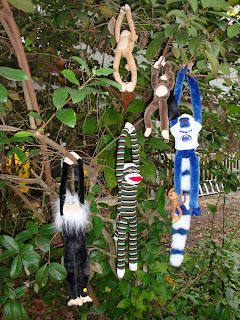 The outcome may be determined by the swing voters, pictured below. More to come when all the votes are tallied!